To ensure your W-2/W-3 numbers are correct, first, compare them with the Taxable Wages and Withheld report. This report may be found in Payroll, Reports, Standard Reports, End of Period, Taxable Wages & Withheld. Reprocess the W-2 information: Go to Forms, Edit Employees W-2 Information and select reprocess all. Then run the W-2s again. Caution: this updates the W-2s to the most recent data in ParishSOFT Accounting, but also replaces any manual edits. Manual edits will need to be reentered. 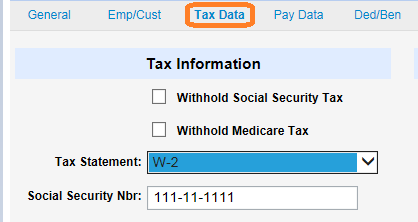 Check each employee record to ensure they are marked as W-2 in the Tax Statement field (see image below). If you are required to update the Tax Statement field in any employee record, you must again go to the Edit Employees W-2 Information screen and select Reprocess All. To quickly ascertain which employee, if any, has the Tax Statement set up incorrectly, run the Employee Record Report for all employees. Use the View PDF option which allows the use of the Find function. Once the PDF is displayed, click the CTRL-F keys to execute the Find Function. Type in the words, No Statement. 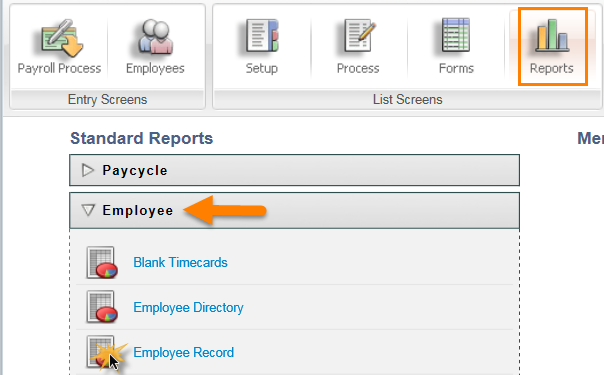 If these words are found in the report, record the employee's name and click the Next Button in the Find Function until all employees are recorded. If new to ParishSOFT Accounting Payroll, you may need to enter your Employee Start-Up Totals under Payroll, Setup, Optional Setup, Start-Up Employee Totals. For additional information on this, see your online Payroll User Guide and search for Start-Up Employee Totals. If you are NOT NEW to ParishSOFT Accounting, but changed the date of the Employee Start-Up Totals this last W-2 year, this will cause a problem with your W-2s. Start-Up Employee Totals are ONLY to be used when you first start using ParishSOFT Accounting in the middle of a Payroll Year and need to record the information to date in the software so correct W-2 numbers are generated at the end of the year. They are not to be used for any other reason. If the Start-Up Employee Totals date is changed, all of the start-up totals will be included in the W-2 generation for the year field of the date which will make them incorrect. Or, you may need to check each employee's Tax Data page to ensure the Federal Tax Withhold box is marked (see image above right). If it is not marked, it prevents taxable wages from accumulating. Although you should mark it now, marking it after any payroll was generated for the reporting year will not accumulate the W-2 totals retrospectively.If this is the case, you must edit the W-2 manually (in Payroll, Forms, Edit Employee's W-2 Information) and the 4th Quarter 941 (which is editable right from the report screen) to reflect the additional wages. 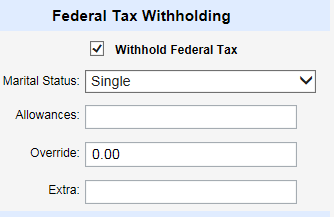 Note: For employees to accrue Federal Gross Wages, but not have taxes withheld, check off withhold taxes, but enter an Override of 0.00 as shown above right. You would do the same for state wages also.